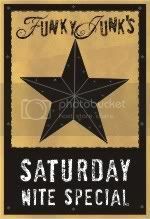 I'm linking up with Funky Junk's Saturday Night Special with this easy little project. If you haven't been over there yet this weekend, you'll wanna go see all of the creative endeavors everyone has undertaken to provide you with some incredible inspiration. The raw talent in blogland blows me away every week! You know the kind. 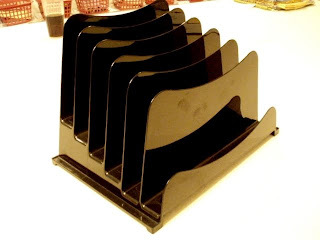 Those thick smoky black plastic file sorters. Ugh. 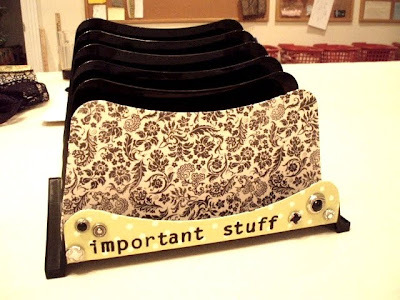 I thought I'd whip out the supplies and see if I could give this drab file sorter a new outfit. I'm sure glad I did. I didn't take pictures of the process, but it's easy peasy. 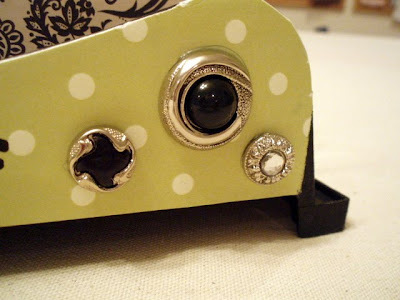 I put mod podge on the short part in the front, and the front of the first large sorter. You won't see the rest, so they don't matter. I then put the scrapbook paper on it and smoothed it out. Then I trimmed around the edges with a sharp blade. And I really do use it. Here it is on my desk. I think I'll try the same thing on my thick smoky black plastic wall pockets next. This simple fix made me smile. So creative, I love this!!! This looks great, Polly! I love the first little short piece with the buttons. What's even better is that you can actually use it! I love your idea. The buttons are great. Very clever! I am finding all sorts of uses for scrap book paper. What did we do before it? You took UGLY and made her a BEAUTY! I would have thrown it out. In fact, three yard sales ago I did! Right in the trash! This is so cute! I might have to look for one at a yard sale or thrift store and try this. 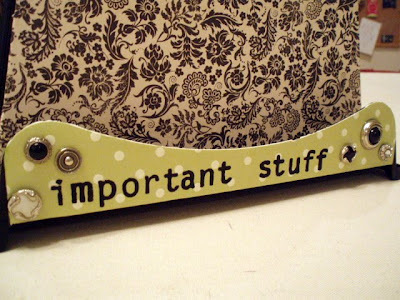 Isn't it funny how we hold on to things now to repurpose instead of throwing them away? 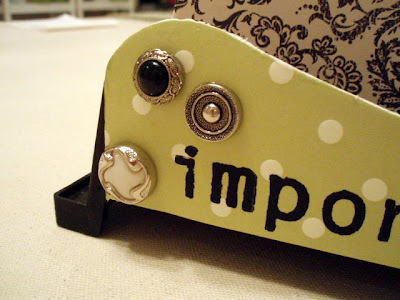 This is a great "green" project and it turned out so darn cute! I have a closet full of scrapbook paper. I don't scrapbook much anymore but I have it handy for projects just like this. What a cute way to dress up something so drab! This is great. Love that you took something ordinary and made it extraordinary. 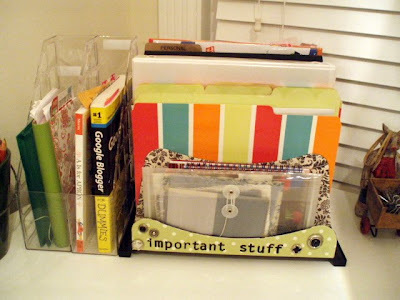 I have a lot of scrapbook goodies left over now I have another idea what to do with them. Thanks for stopping by Becolorful and leaving such a nice comment on my crazy colorful credenza post. 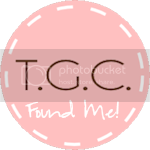 I found your blog via Layla over at TLC. In fact, it was your work apron that brought me over. I bought 2 of them from your Etsy shop and I cannot wait to get them!! I just finished reading your archives and I love how inspiring and motivating your blog is! This project was fabulous! Scrapbook paper is the only thing that can hold a candle to a can of paint! Polly, This is not only a darling project but so practical! Love it! Love it! What a simple and easy fix to an otherwise mundane item. Certainly brightens up the office a bit! Love it - I have all those supplies on hand as well! My craft room is in a pitiful state right now!! PS - I just send you an email - hope you get it! Great idea. I am sitting here thinking of all the things I could mod pod on. Oh I am so glad this was saved from the landfill. It is really adorable. Thank you for sharing. Looks fabulous! I love it.